Situated on the site of a historic landlord's residence [more...] with spectacular panoramic views of the Atlantic Coast, Clonmore Lodge offers home-made scones and tea on arrival. Near to easily accessed quiet beaches, with looped walks/runs from the doorstep. 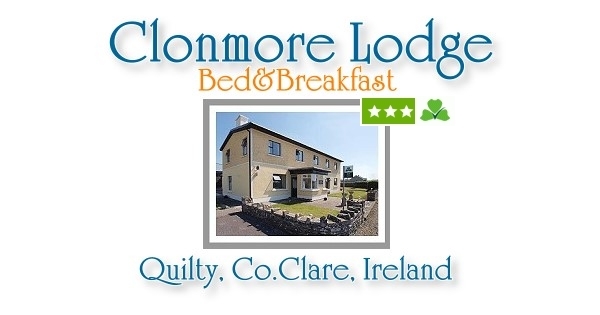 Clonmore Lodge is a family run B&B in business for over 40 years. We pride ourselves in creating a welcoming family atmosphere and our guests are important to us. We are committed to providing the best possible service to our guests whilst minimising the impact of our business on our local environment. 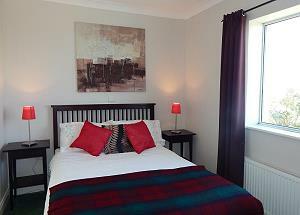 Featuring beautiful sea views in many rooms, every room at Clonmore provides an en suite bathroom and a hairdryer. 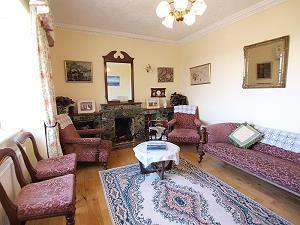 Guests can relax in the room with a TV and enjoy a cup of tea or coffee. All rooms are en suite. The bathrooms have recently been renovated. 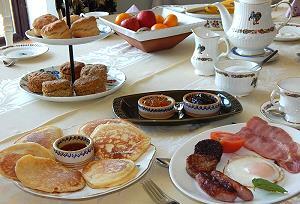 We serve freshly home cooked breakfast. We make our own bread, jams and preserves and are famous for our pancakes. Our comfortable guest lounge features an open fire place, ideal for the cooler evenings. 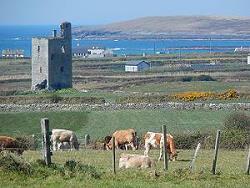 We are located on the N67, the Wild Atlantic Way, 1 mile south of the seaside village of Quilty.. The famous Cliffs of Moher are located 30 minutes’ drive away, and the busy surfing centre of Lahinch is 20 minutes away by car. Shannon Airport is a 1-hour drive away. Free guided walks to local archaeological and historical sites can be arranged for guests. We have a Tennis court in front of our house. Walkers, Cyclists, Adventure seekers are all welcome. There are plenty of opportunities along the west coast . We offer storage for your outdoor equipment! 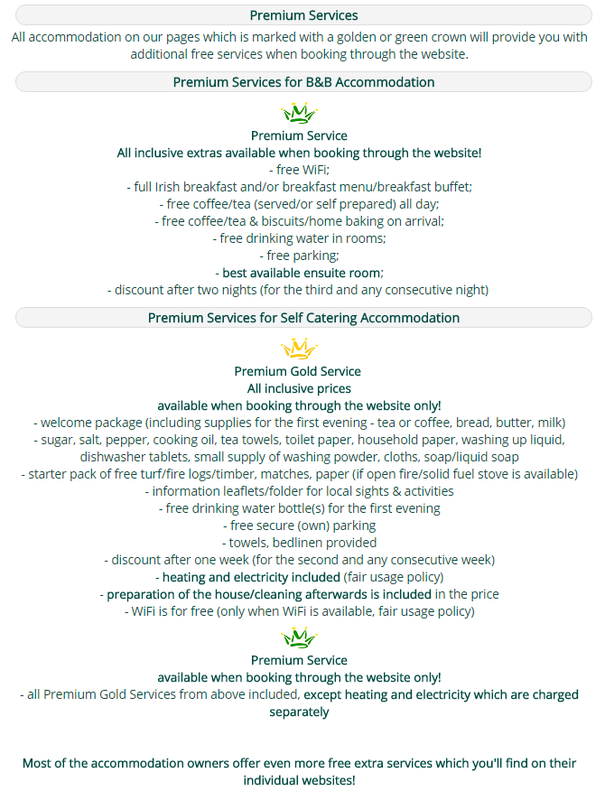 Situated on the site of a historic landlord's residence with spectacular panoramic views of the Atlantic Coast, Clonmore Lodge offers home-made scones and tea on arrival. Near to easily accessed quiet beaches, with looped walks/runs from the doorstep. The famous Cliffs of Moher are located 30 minutes’ drive away, and the busy surfing centre of Lahinch is 20 minutes away by car. 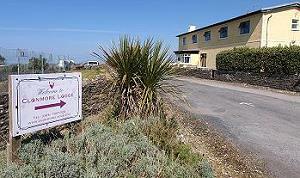 Shannon Airport is a 1-hour drive away, and the house is located 1 mile south of the seaside village of Quilty. Free guided walks to local archaeological and historical sites can be arranged for guests. The building itself has a 200-year old cottage attached, and the site itself dates back to the 1500’s.